Google Now on the Xperia L gets activated with a press-and-hold-and-upward-swipe of the virtual Home button. You can either type or talk to it and the app will give you one of its info cards (if available) and read you its contents aloud (you can disable this from the app settings). If there's no card to help with the answer to your question Google Now will simply initiate a Google web search instead. The Sony Xperia L phonebook has also been upgraded since the last iteration under JB and, thanks to the light background, it looks livelier. The bottom bar holds shortcuts to search option, add number field, and the advanced settings menu. The tabs for Contacts, Phone, Favorites and Groups tabs have been moved to the top and can be side-swiped. Receiving and making calls on the Xperia L was great. The built-in secondary microphone is used for active noise-cancellation, so calls are loud and clear even in noisy environments. Thanks to the proximity and accelerometer sensors, the Sony Xperia L automatically disables the touchscreen when you lift it up during a call. We ran our traditional loudspeaker test on the Sony Xperia L with xLOUD on and off. The results were equally impressive and got Very Good marks. With xLOUD off the Sony Xperia L even managed to set a slightly higher score, which is interesting. In reality we didn't notice the difference with our ears so you won't either but the oscilloscope did. 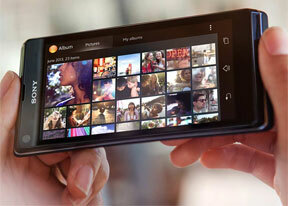 As for text input, the Xperia L offers a customized on-screen full QWERTY keyboard. Typing on the portrait keyboard is fairly comfortable - the screen is big enough to house decently-sized keys that are easy to hit.